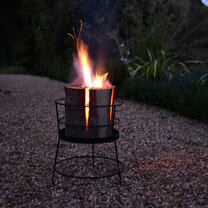 This Swedish torch and basket means you can enjoy your garden by the magical glow of firelight. Forget going inside when the sun sets, this Swedish torch set means you can stay outside and enjoy time together while the flames cast a gentle glow across your outside space, and it creates a cosy atmosphere for those evenings with family or friends. Just imagine cosying up with the novel on a summer’s evening while the flames keep the chill at bay…or dining al fresco after sunset by the light of the torch. A slightly unusual take on the ever-popular firepit, this garden heater makes it easy to enjoy as much time in the garden as possible. This product enables you to burn the torch in a safe, elevated place, and because of the removable lower half it’s easy to store in between uses. 31.1 x 31.1 x 38cm. Complete with small Swedish Torch. Allows you to burn the torches vertically in a safe and elevated place. Easy to store because of removable lower half. 31.1 x 31.1 x 38cm. Complete with small Swedish Torch. Light up your outside space in style, with this beautiful Swedish torch and basket. This garden heater’s all about making the most of your outside space after the sun goes down, and it makes a talking point for those occasions when you share your garden with friends and family. We know that you all work hard on getting your gardens just right for those al fresco gatherings, and this beautiful torch adds the finishing touch to any space.